A Nogais Tatar Lady, Princess. Home » A Nogais Tatar Lady, Princess. A Nogais Tartar Lady of distinction. In the centre of the group a Princess of that Nation, attended by a Female Slave, 1803. Une Femme Tatare Nogais de distinction; au milieu la Fille d’un Prince de cette Nation plus en arrière une Esclave. THE Nogais wandering between the rivulets Berda and Moloshna, the small remains of the numerous horde which was lately distinguished by the name of Kubanian Tartars, have within the last ten years been transplanted from their former habitations in the vicinity of the Kuban, to these beautiful pasture-grounds, where they enjoy tranquillity and abundance; for, while dwelling between the turbulent Circassians and Calmucs, they were involved in continual warfare. The dress of the men consists of sheep-skins, and a coarse kind of cloth; their caps are of different shapes, but those most generally worn are small and round, so as to cover the Lead only as far as the ears, and are manufactured of lamb-skins. As to the dress of their women, “I caused,” says Professor Pallas, ” a drawing to he made of that of a young lady of’ distinction, the daughter of Bajazid Hey.” An engraving of this drawing is given in the opposite ‘ate, where she is represented in company with her mother and a female slave. 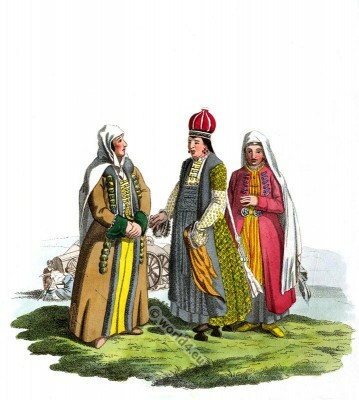 The girls generally wear the Circassian cap;. the married women have adopted the veil, according to the custom of that nation. The Nogais Tartars do not shut up their females. Conf nimbly to the usage of all Asiatic nations, a Kalym, or marriage portion, which with the opulent consists of forty mares, two horses completely caparisoned, a suit of armour, a gun, and a sabre, is, on the celebration of the nuptials, delivered to the father of the bride. Their food, like that of the ancient Mongoles, consists principally of horse flesh and mare’s milk: this mode of living is, however, entirely relinquished by the Tartars of the Crimea. The language of the Nogais is said to vary in many respects from that spoken in the ‘Taurida, which is a Turkish dialect. These people possess more activity and vivacity, but they are likewise more rapacious and ungovernable, than the inhabitants of the Crimea, and retain the primitive customs of their forefathers, as well as a predilection for a wandering life. This entry was posted in 1803, 19th Century, Russia, Tatars and tagged Edward Harding, Russian national costumes, Tatar national costumes on 11/10/14 by world4.